This week on #SEOTalk we had some amazing discussions on Google Hummingbird. There were so many questions and few were pretty intriguing. Here are the transcripts of the entire Twitter chat. While I had captured the essence of the Google Hummingbird update earlier, many of the participants were still perplexed with the update. This post is an aim to answer each of these questions and share few more information beyond 140 chars of Twitter. For starters, it’s a new search algorithm. No, it wasn’t released on Google’s 15th anniversary, but it was put to test a month prior to that. According to Google, the new algorithm will improve the quality of search results. 2. What does Google Hummingbird do? The new algorithm decides how you will see the search results. The changes being effected are to understand more human, conversational style, long search queries. Effectively, this means that, you can no longer depend on few keywords to master Google Search. Instead, one has to write better content in a way that it provides answer to certain questions. One of the post explains three patents that are believed to be part of the Google Hummingbird update and they talk about synonym identification, substitution rules and concurrence of the term. If we try to understand those patents a bit, they would be actually translating the query and look for the context of the query and also look for synonymous words. Thus improving the quality of search result. According to one more post at GodOverYou, the content writing should be able to answer questions according to the 5W’s – Who, What, When, Where, Why and How. All of these point to the fact that, all the content that are stuffed with keywords is now passe. In the era of Google Hummingbird, write content around long-tail subjects and in a way that it would answer to human questions. They are still in place, because as Jaydip Parikh mentioned in the chat, the Google Hummingbird update is not about how you rank, but it’s about how search will show up in response to your query. These updates still form a back bone of the new algorithm. So, be careful of your link building tactics and other black hat SEO mechanisms. Pagerank still matters and so does quality content. Semantic search is Google’s way of showing you the best possible results, depending on your location, online behaviour, your network, trends, etc. Thus content creation along with great amount of social interaction will be vital and also authority. Though, at the heart of semantic search is ‘Knowledge Graph’. The Google Hummingbird update has suddenly brought the focus back on Knowledge Graph. In the simplest of terms, Knowledge Graph is a repository. It is what Google searches into, to give you results. With the latest update, capabilities and filters have been added to the Knowledge Graph. So something like, ‘show me restaurants around me’ will leverage the location data and translate the query to show places around your current location where you can eat. 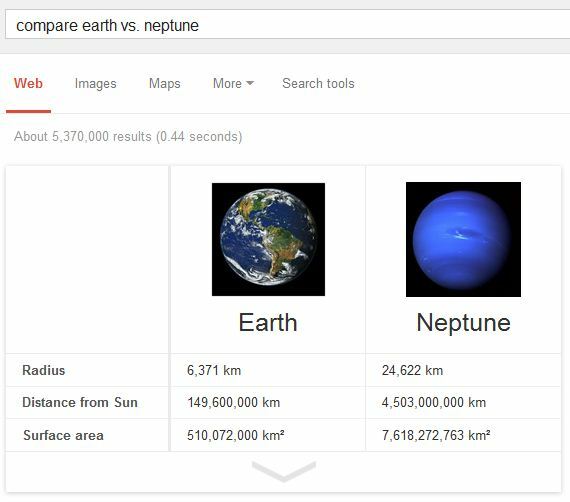 Or, if you’re trying to compare Earth with Neptune. The information from Knowledge Graph will be picked up as follows. If you tell your Nexus 7, “OK Google. Remind me to buy olive oil at Safeway,” when you walk into the store with your iPhone, you’ll get a reminder. 5. What happens to the SEO process? Yes, you heard it right. Nothing is needed if you’re doing things the right way – writing good content, social sharing, no keyword stuffing and backlinking from good PR sites. But if your content is not answering any questions and is still full of keywords, beware!! While I am still exploring the Google Hummingbird update, if you have any questions or additional information – share right now! !